The Swingline™ LM12-30 shredder's micro cut shred size makes it suitable to shred classified documents; micro cut shred size is securer than cross cut shred size. The micro cut shredder can shred paper, optical media, credit cards, paper clips, and staples. 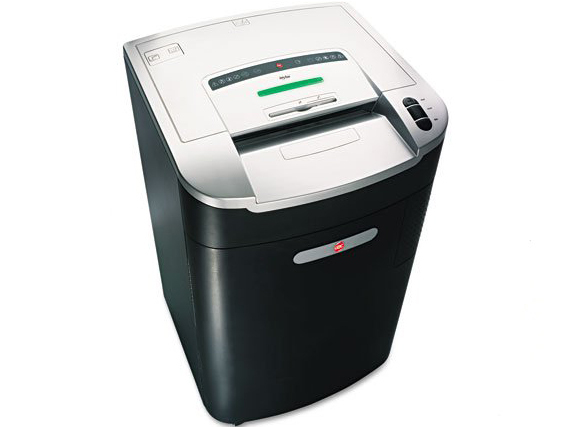 The Swingline™ shredder is a super quiet shredder; perfect for large offices. Thanks to Jam Free™ technology, the micro cut shredder shreds continuously. When too much paper has been inserted in the Jam Free™ shredder, the Swingline™ LM12-30 shredder stops shredding and blinks. The Jam Free™ shredder features separate cutting blades for paper and optical media. The Jam Free™ shredder features thermal overload protection. The Swingline™ LM12-30 shredder has a wire-frame waste bin configuration; plastic or paper bags can be used. The Swingline™ shredder features automatically oiling of the cutting blades to enhance blade life. The Swingline™ shredder also automatically cleans the cutting blades to enhance production. Automatic cleaning of blades removes clutters around blade. Cut Size 1/8" x 1/2"